This walk combines a fairly easy stroll in the Chilterns through a mixture of woodland and sloping meadows, with an optional visit to Hughenden Manor and West Wycombe "Hell Fire" Caves. After a brisk climb from the Caves up to Dashwood Mausoleum, it is then an easy level stroll back into Saunderton. Hughendon Manor was a medieval manor, later bought by Victorian Prime Minister Benjamin Disraeli in Protected content . He used it as a private retreat until his death in Protected content . The house contains most of his furniture, books, and pictures and the garden has been recreated according to the design of his wife Mary Anne. 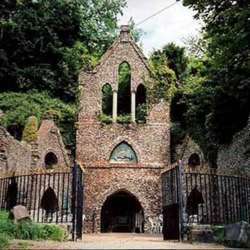 West Wycombe Caves were built by Sir Francis Dashwood, who built the house at West Wycombe Park in Protected content local labor. The individual cells of the caves are called the Recess, Whitehead's Chamber, XXII, the Labyrinth, Children in the Caves, the Great Hall, the Minders' Cave, the River Styx, the Cursing Well, and the Inner Temple. Length of the walk: 16km (9.9 miles), 5 hours. For the whole outing including trains and lunch break allow approx 7 hours. Protected content we'll then go in small groups to buy our tickets ( please make sure that you arrive on time as we won't be able to wait for latecomers). We can meet at Protected content and sort out the tickets together in order to get a group discount.